For a Birder like me, all I need a pair of binoculars and a place to bird. I have this dream to go birding all over the Country and try to see as many as birds at a stretch - hitchhiking. Work here and there, three to five month on road. But this will take some time, I have to prepare properly. Whatever it is, it’s not just ticking of birds but the whole experience in travelling n birding. Early this month i got my leave which i was not prepared , as holiday season train tickets were not available. I wanted to visit some new places and do some birding. My friend Jayanth had plans to do trip in Gujarat to Velavadar and Kutch, so i was planning but for some reasons he had to change his plan. I however thought of a backpacking birding trip to back home. So it took more than two weeks, three states, four sanctuaries, truck, rickshaw, bike, train and twice more than 26hrs continues bus journey to reach home. From Kanha to Bangalore. From Kanha to Pench form there to Nalsarovar near Ahmadabad, Velavadar Blackbuck Sanctuary. To Goa straight from there, for few Western Ghats endemics and some waders at the beach ;-). And finally to Agumbe rainforest for the King Cobra and back home. The one thing i missed in this whole trip was a wide angle lens. I made new friends and saw new birds. I reached Ahmadabad on 7th evening after spending sometime at Pench and taking 28hr bus ride. Some how i liked the city, the old part of the city with the kite festival coming soon, everywhere there were very colurfull kites . Next day early morning i left for Nalsarovar which was just an hour and a half bus ride away. I saw very interesting birds on the way itself. 50+ Pelicans on the road side fields, Cranes, Harriers Wow!. I didnot expected that. Met Kasim at Nalsarovar who was Jayanth's contact, he is a boat man and a guide. He had work in the city so his son took me out. I totally did 7hrs on the boat - birding. The whole water body is fantastic its more than 100sqkm! with small islands here and there. Flamingos are main attraction for regular tourist and one can see more after March. I got lifers like White tailed and Grey headed Lapwings, Greater Spotted Eagle, Eurasian Curlew , Common Starlings and many more. Gulls were common they were coming close to boats for food. Common Coots were in plenty . 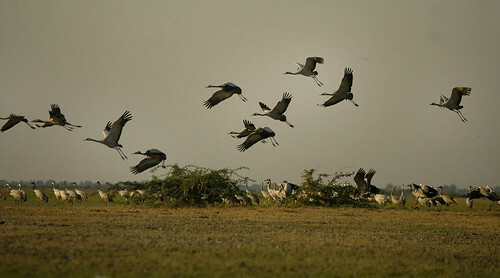 Best was to see common cranes close and in numbers and their calls. Water is very shallow from 2ft to 4ft and clear, you can see the weeds and the fishes. The people around the camp are mainly maldaris who graze buffalos and few fishing communities. Having lunch in one of the place was excellent. I just spent only one day there but need to visit again for few days for more birds. Total 60 + birds was great for a day. Next time with proper optics like birding scope it will be even better. 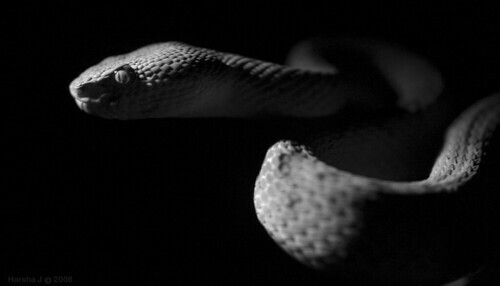 Ever since i have got interested in reptiles and started handling them, one species of snakes always fascinated me. But in spite of searching i never found a alive specimen of that snake. Last trip to western ghats i thought i would definitely find one but did not. Once many years back while rock climbing at Ramanagara i thought i found a Bamboo Pit Viper and photographed it like crazy, but later even experts got fooled because it was an new species of Cat snake which looked exactly like Bamboo Pit Viper. I keep regretting for not doing scale counting of that snake and recorded it properly. If i had done that and collected that specimen i would have discovered a new species of Cat snake!!. Anyways coming back to this snake, i like it coz they have this amazing sensory organs which can detect heat in absolute darkness! They have these pits which looks like large nostrils which acts like thermal cameras! to hunt their warm blood prey. There are many species of Pit Vipers in India and Bamboo Pit Viper which i saw it for the first time alive in wild here at Kanha just few mins back is widely spread pit viper in India. I had seen couple of road kills and i was hoping to see one alive. As it was dark and found it crossing the main road i just managed to get 2-3 decent shots and let go of it off the road. Crouched in uncomfortable position in small dry gutter next to roadside at Kanha, i was trying to focus through my macro lens to get a closeup shot of this damsel. I did not have tripod and light was low, so i had to be as still as possible so that at close up 1:1 macro there is no shake and not to disturb this damselfly. If i make any sudden movements this would fly and again its not easy to approach so close. But one damn mosquito was bothering me, it was so close to my ear i felt like getting this mosquito first. 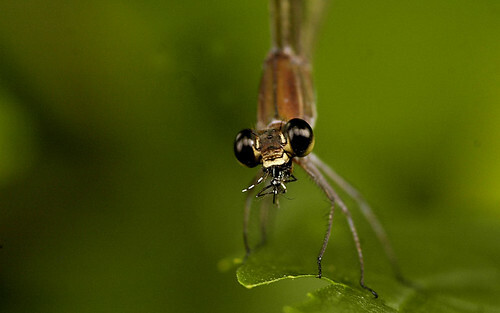 But damselfly came clearly in the frame and complete close up and i was about to click, the mosquito landed on my forehead. Before i could react the damselfly was fast it disappeared from the frame and i was wondering where it went, it came back to same place where it was but this time with mosquito!. Damselflies and their stronger looking cousins the Dragonflies are raptors in insect world always hawking for mosquitoes, midges, other tiny flying insects, they also feed on each other, grasshoppers and butterflies.Many damselflies spend time in grasslands inspecting each blade of grass for tiny insects and mosquitoes. Though i had interest in them i had not closely looked at them, thanks to a friend- David who freaks out on these insects, Now I am spending more time trying to id and photograph them. What fascinates me more is when they are adult and in air, the way they fly. 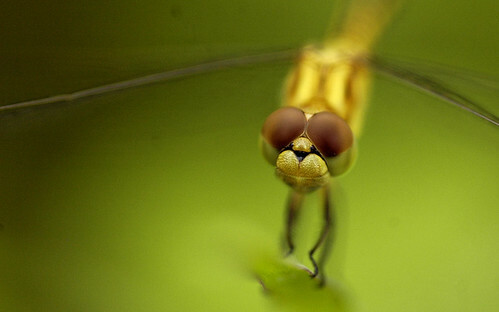 They are so quick in catching insects or chasing each other and while courting. Glimpse to the Southern Western Ghats! I was walking through a small patch of shola with Noella, Kalyan had walked ahead of us in Rajamalai a tourist place of Eravikulam National Park, when i heard a bird call which was not very far. I knew i had not heard that call before so i just tried mimicking the same. To my surprise it worked and the bird i couldn't see just started responding, so i walked into the bush and sat & called again. It went on for 3 to 4 times when i heard the call very close may be less than 3 mts but as it was thick undergrowth i couldn't see the bird ... thats what i thought but it was in open! The dark blue and its because of its size i could not see it! It was White-bellied shortwing! A Western Ghats endemic found in Shola forests which i was hoping to see for really long time. Palghat gap splits Western Ghats into Southern and Northern western Ghats. 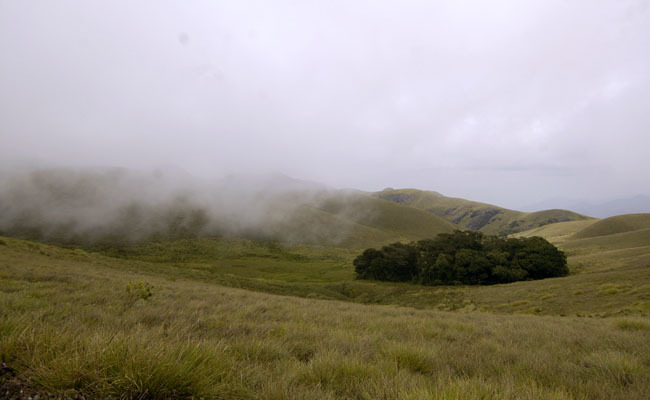 Many species of flora and few of fauna are endemic to Southern Western Ghats and holds few beautiful rain forests and spectacular grassland landscapes. I just got a glimpse of this place for few days at Munnar(Eravikulam) and some parts of Valpari (Anamalis). 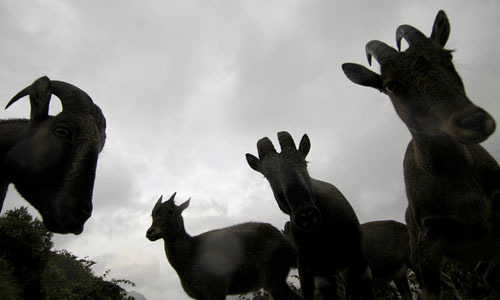 Nilgiri Thar or Mountain Goats at Rajamali is very common and so used to humans. Its very interesting to see their habitat- those rains, cold winds, sloppy and slippery landscapes, they are really adapted here. I am hoping to see their cousins at Himalayas! We did a very short trek but did not get permission to go to the famous Grassland part of the Park which has one of the best landscapes in Southern India. Its good that permissions are not easy as it can turn into another tourist spot and destroy. Just managed to see a part of grass land! It was raining and cloudy most of time so did not see many birds but sure will go back soon again! Monsoon is here and all the these little so called ' creepy crawlies' are out in numbers. This is what i have been waiting for. Monsoon triggers lots of new activity for all, many creatures would have been buried under ground for months and waiting for rains to arrive so they can emerge and others just start to multiply! as the food is plenty. 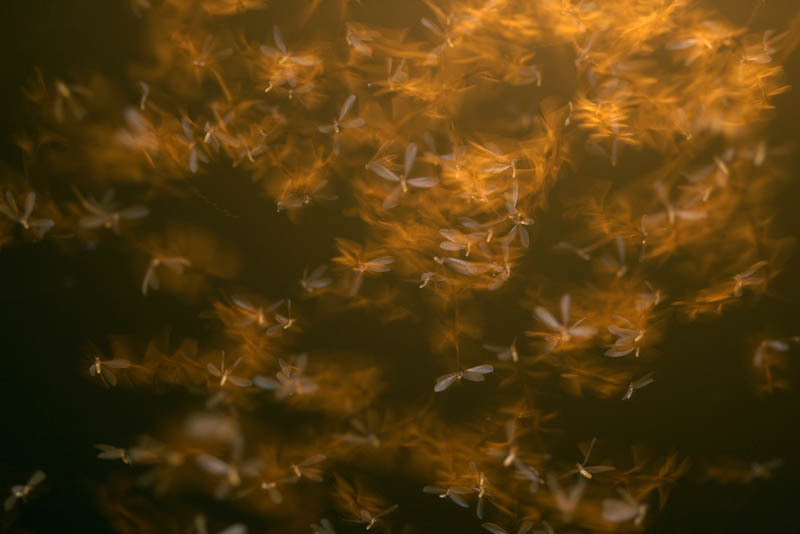 Lots of Ants and Termites take this opportunity to produce enormous number of winged males and female which are know as Kings and Queens, which emerge from their respective colony and fly away from there and start a colony of their own. 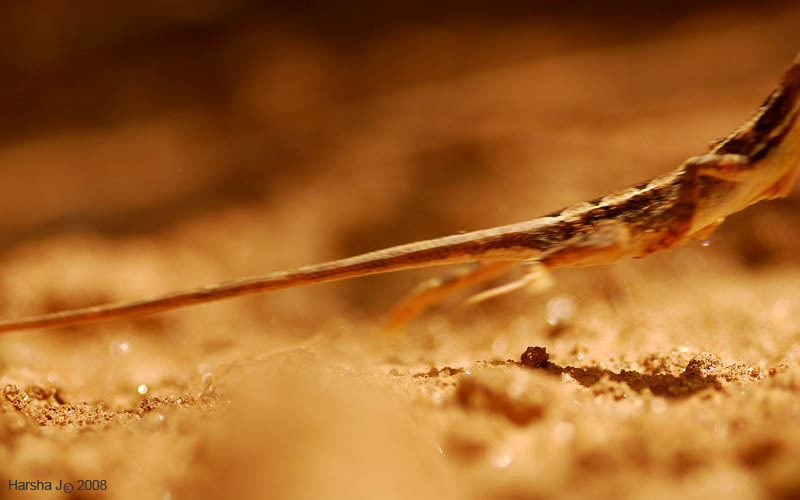 Winged termites are especially nutritious food sources for all the animals around. You name it they will be feasting on these, Insects, amphibians, reptiles, birds and mammals. Even most of time vegetarians like doves & palm squirrels don't miss this feast. My best is to watch birds getting crazy for these in the jungle, suddenly all kinds of birds are at a termite mound where theses are emerging and i would like to write about it when i get good pics of those different birds 'fly-catching' termites. When the night comes then all my favorite ones come out- lizards, frogs, bats and large insects, and these who come to feed they intern attract other creatures like snakes!. Termites try emerge at nights to avoid diurnal predators and now at night they get attracted to artificial lights and these attract me to go and observe them and also try to get some pics. Few nights back as i was walking back to my room, i saw there was late night emerging so went and checked. 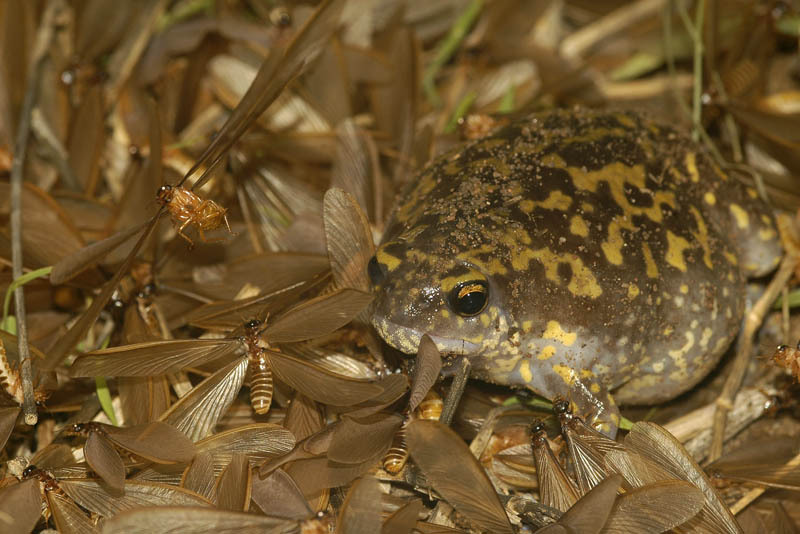 There were lots of geckos on the wall feeding, as i went closer i saw this huge balloon frog almost bloated like a balloon after feeding on termites! There were few more different frogs in the grass and insects like preying mantiz but something else caught my attention which was running around, it was a cockroach! As i went closer i saw it catching and feeding on termite! 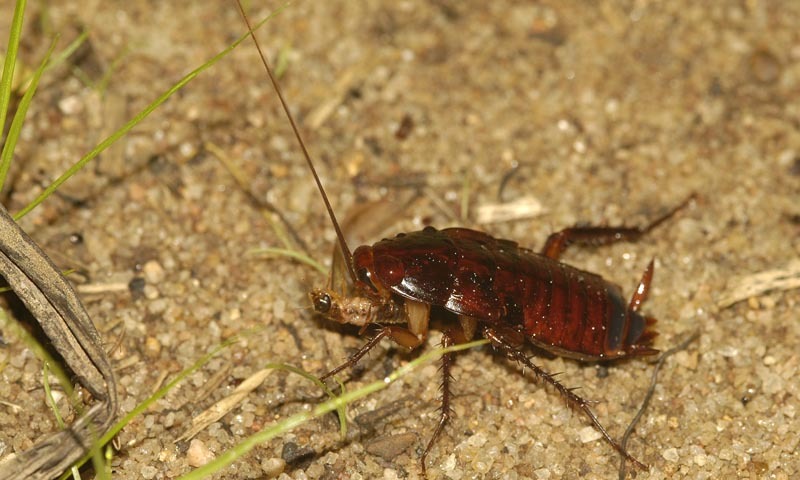 i knew these roaches eat anything and every thing but i did not think they would hunt!. 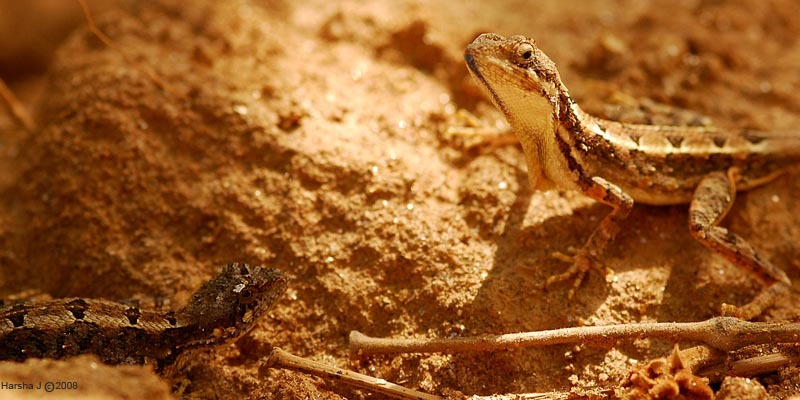 A small well camouflage lizard ran real fast and became still and immediately disappeared blending into its surrounding. Karthik quickly caught it and started looking at the lizards legs and said ‘ this is …’, me next to him excited and to show even I know few lizards name uttered few names fast before Karthik could, not allowing him to say. He said ‘wait look at these toes they are only four instead of five so this is your Sitana Fan-throated lizard!’ These lizards were common where we are but I had not noticed it before but I knew about this. We were in a small patch of scrub forest outskirts of Bangalore birding, where I saw these lizards for the first time this was around 8 years back. Since then this lizard fascinated me and i always wanted to photograph it. 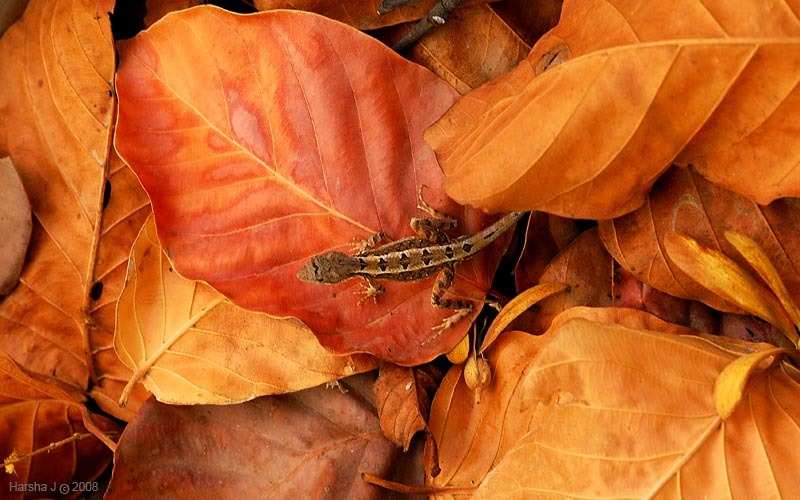 Now after many years I was lying in an uncomfortable position in leaf litter trying to shoot this lizard display. 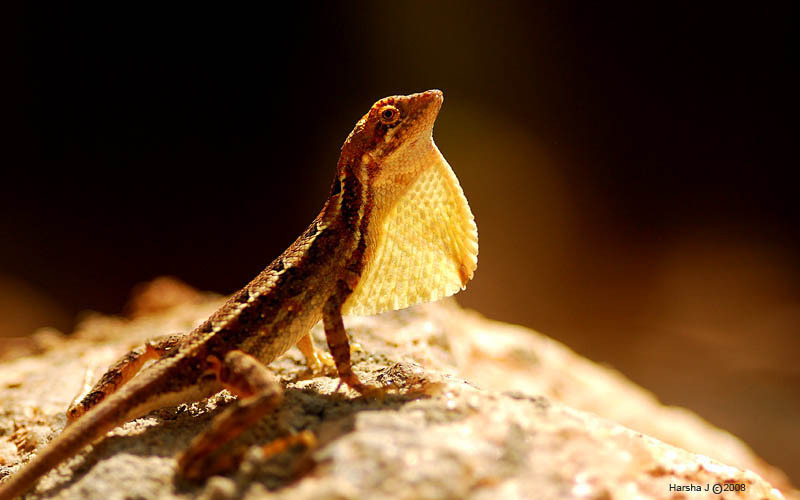 Males have these beautiful throat fan or dewlap, that is how they get their name, which is used only in breeding season that is now in summer to attract females and size up with rival males. After many attempts i finally got one decent frame of this lil fella show off. The dewlap/fan also gets beautiful blue colour. As the female came closer he got excited and started approaching her closer with his head up and female responded with lowering her head to the ground but nothing happening she ran from there followed by the male. Same repeated again at different place but they dint mate. Actually i like this lizard for another reason, the way they can run! they are also bipedal, when they run they run very fast and with their two hind legs! its so fast one cant easily make out. In the one the frame which i almost deleted thinking its a blur shot, actually i had just missed a running shot!!! "Haavu!" shouted Thavrgatte and jumped over a small stream, i have never seen anybody jump instantly so high!. Thavrgatte had a obvious reason to jump, he almost stepped on a huge python!!. Thavrgatte a forest guard at Bandipura National park, with him another guard and my friend Murthy and myself we were at Gopalswamy betta (hill) in Bandipura on a short trek. The jungle was at its best with lush green after few pre-monsoon showers . Murthy and myself met up with Thavrgatte in his make shift camp under a rock in the hill which is their anti-poaching camp in the morning and had jaggry tea over looking jungle and the blue mountains which is no wonder called Nilgiris as they look blue from far and Bandipura forms part of its Biosphere Reserve. After Tea we set out for the trek where Thavrgatte got his double barrel gun and said 'today i will show you tiger and we can get close to elephants i am not sacred of anything in the jungle as i am born and grown here'. Thats true this forest was his home and not only he knew the area well but had amazing experience as he was also ex- Veerappan informer, poacher and every time i used to pull his leg by mentioning Veerappan's name he used to get angry. Now as he is a changed man he is appointed as forest guard. As we trekked down from the camp few 100mts i saw fresh sets of tracks near a small spring on wet mud, it had claw marks with tail dragging. It was unmistakable tracks big monitor lizard and as i showed it to others Thavrgatte got very excited and said 'i will track it and we can catch and you can take picture of us with it and release it! ', 'ok lets track it' i said. We split to track in wide area as the tracks went into under growth, i went straight to small rocks which was next to bushes and as i was looking there Thavrgatte called ' saar its here' and as i turned around thats when he jumped like no man has jumped!!. laying still in the undergrowth was this huge python and it looked like it had eaten something just then. Probably the lizard which we were looking for?!. May be it, as the swollen part of the snake looked like longish and big, like big monitor lizard!. 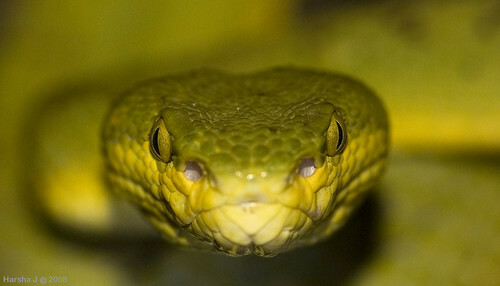 And i have met , seen and heard about many tribals, they all are brave and not afraid of anything in the bush but snakes!. The snake was a beautiful specimen of easily 9-12ft long. And as we were close, it had taken its striking position. 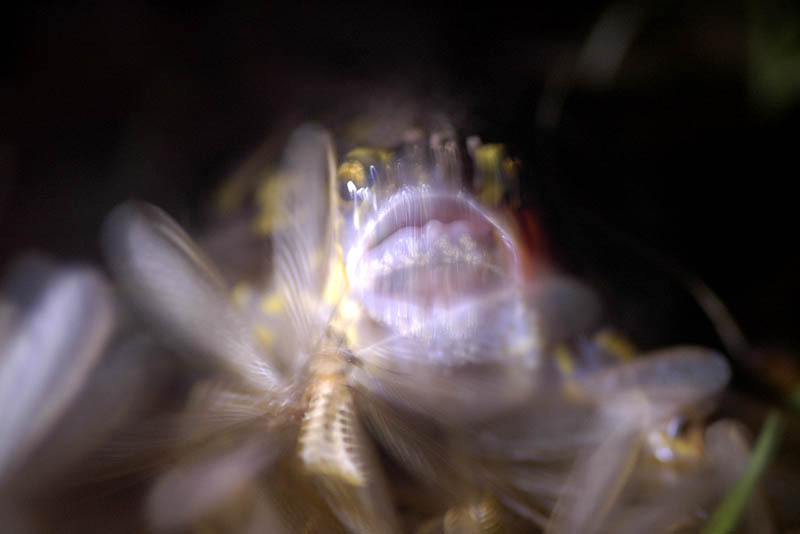 All of them were insisting me to catch for which i refused as it may regurgitate due to stress. I asked them come little closer and have a good look before we leave this snake alone to digest its meal which would easily last for many days and also took few of these pictures with my film camera and many months later these pics were scanned and i had lost the cd until recently i found it. I am missing those Bandipur days trekking in the forest and seeing these amazing things on foot. Later that days trek Thavrgatte kept looking at me and smiling, recalling the incident. Tigers: Spy in the Jungle! Finally one of the best footage so far on Tigers is out last month 'Tigers: Spy in the Jungle'. It was filmed here at Pench for nearly 3 years! Made by one of the best media company John Downer Productions ltd . When ever i used to meet them in the park while driving i used to ask how is it coming? whats new footage they got? when it will be ready?, and i had visualized what ever they said and imagined how it looks whenever the tigers moved close to those low level cameras they used. now waiting to see it. Geff who is amazing with his engineering, creating new camera equipment every day making and fixing it in the field and Mike cameraman always on elephant following the tigers and filming them. Mike driving Geff using his new invention. I guess soon it will be released in India and i am sure Pench is already getting popular in Europe as its already aired there. The 2 female and 2 male cubs in this movie are now adult and independent. Females have formed territory in their mother's territory and males are not sure where they go and come but they are seen once in a while. After long time i visited few places and also trying to update my blog. I came home from Pench after few months, met up with my old school friend shivakumar_l and made quick visits with him and Jayanth to Ranganatittu, Bandipur, stayed in Mudumali, made a quick trip to Ooty for some endemic birds and a afternoon boat safari at my fav place Kabini backwaters.And all these in 2 days. 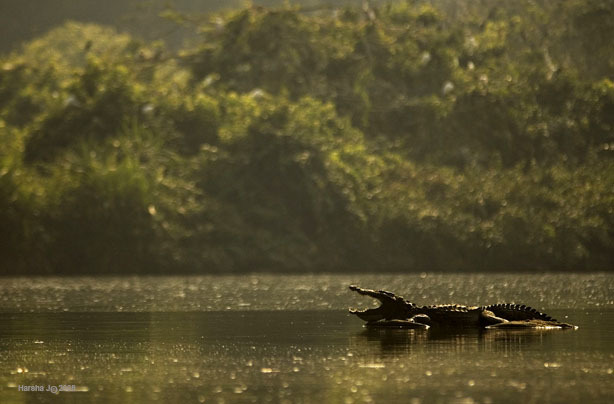 Ranganatittu Bird Sanctuary was good, got this croc shot. They are so used to people they dont even bother a little. At Bandipur did not see much but i was happy to visit the park and see few friends and felt really good for just being there where i work and learned a lot about the jungle. Kabini was good again to meet old friends and another place where i used work. Saw lot of crocs and Jayanth & Shiv managed to get great shots of Osprey. I am back at Pench now, but before comming back managed to do some quick trips Maidanhalli black buck sanctuary for the Antelopes, foxes & birds. Drove to Honavar for Olive Ridley Turtle hatchings! 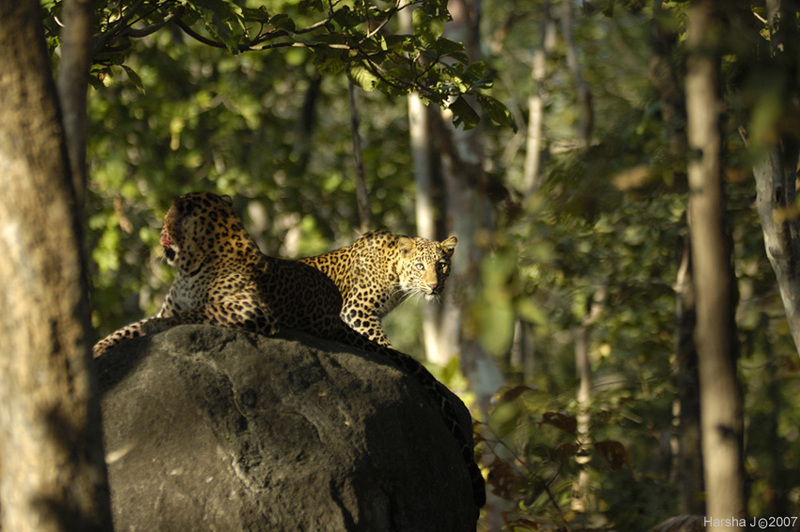 and from there to Daroji for Bear with Cubs!. Will post all these and more soon. This winter looks like a season of cats for me. Big cats. Now that I've settled in the Pench National Park and doing safaris more often, it is getting real interesting. Here, sightings of large predator the Tiger is not as common as in Bandhavgarh or in Kanha but there are good densities of wild dogs and the elusive, adaptable, little big cat - the leopard! Leopards are the most successful of big cats. One of the reasons is that they are shy and secretive. That helps, especially in places where its bigger cousin, the Tiger, reigns supreme and also where ever it is close to human settlements. They are not easy to see and you always get fleeting glimpse or hear that unforgettable sawing call. An early morning, a few weeks ago, we were driving in an area called ‘Jodamunara’. While driving in this area, the eye wouldn’t miss the huge black rocks and boulders which are all over the place. The road winds like a snake with ups and downs since it's a hilly terrain. 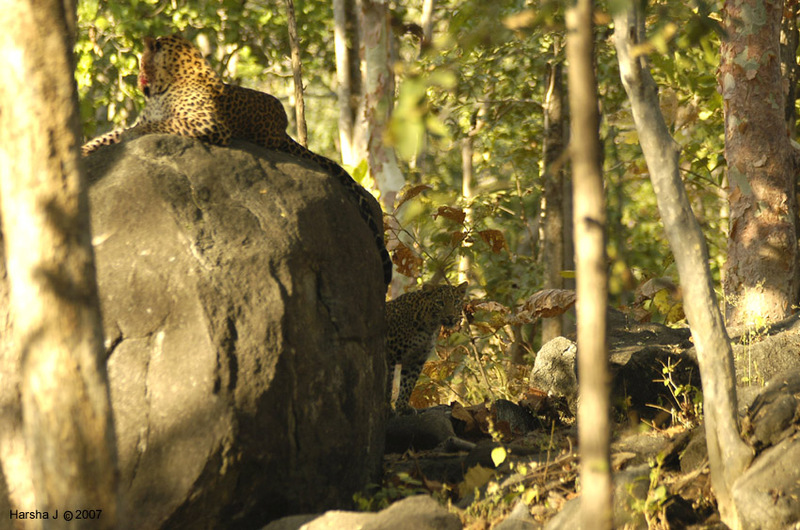 I was keeping an eye on rocks, as my first sighting of a leopard in Pench happened just there late last year. We came to a turning, when suddenly our guide shouted leopard!Less than a hundred meters ahead I saw one leopard jump off from a small boulder which was on the roadside. Then we saw another and that was still on the same rock. Two leopards!! WOW! I immediately asked the car to be stop. Himanshu, my colleague, who was driving stopped the vehicle and I asked him not to move till they are comfortable by our presence. The one that jumped was much smaller compared to the one that was on the rock and with quick look through binoculars we conformed smaller one was female and big one was a male. A courting pair! face by the desperate young female. Seth, the Head Ranger from CCAfrica Phinda of South Africa, who was with us for five weeks to train us was with me. Looking at the swollen face of the leopard, we came to this conclusion: When female is in estrus, she advertises by sawing. 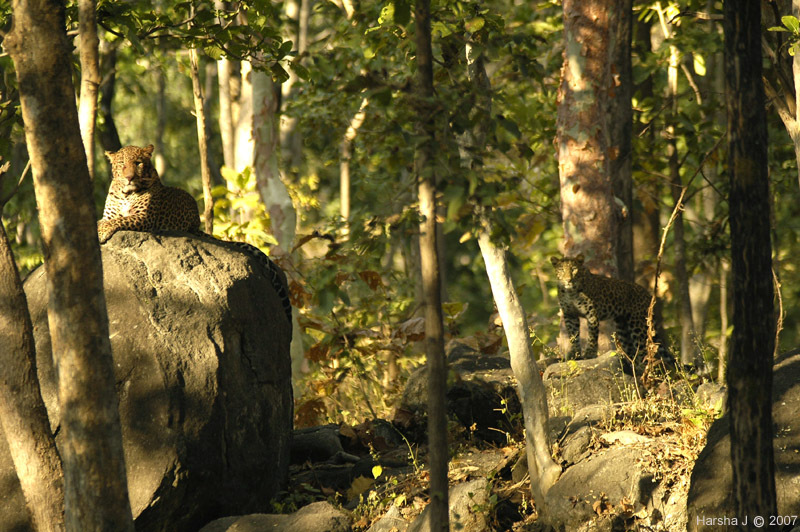 Sawing is a way where leopards call for marking territory or for mating. It is fairly loud, similar to the sound of a saw cutting wood but difficult to explain in writing! This sawing along with the scent marking of the female would have attracted another male from different territory. 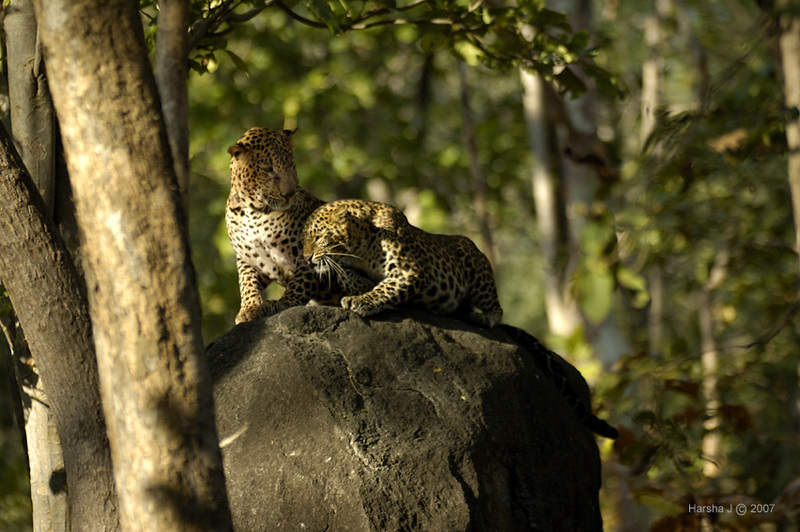 And it was quite possible that both the males would have fought during the previous night.And when the male leopard jumped off the rock in the end we actually saw him limping. So, it must have been a fight with another male and few on the face may be courting fight with the female. Anyway, we slowly approached the couple to get a good look at them. The male was not at all bothered by us but the female looked nervous. I had a little knowledge of leopards, but Seth has amazing experience with them since he does specialist safaris there which deal with tracking leopards! We knew the female would come back eventually. We waited there patiently and now we were less than twenty meters from the leopards. The female who was moving around was now getting a little comfortable she came into our full view making loud purr. She came much closer without taking the eyes off us and then right under the rock. The male hardly reacted to her. 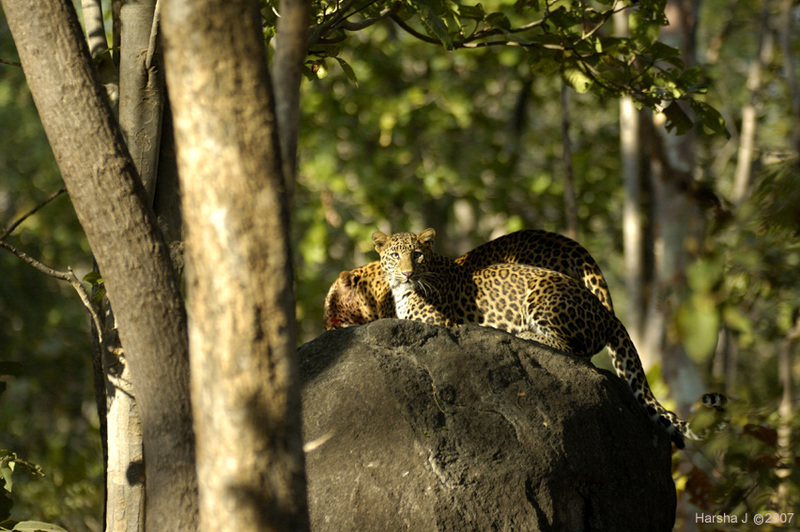 Then she jumped on the rock going back and forth around the male, who was basking his face to sun where he was bleeding. A few seconds later it was over. Both jumped off the rock and we could see the male limping as he went behind rock sat into the grass. We waited for few minutes and the female came back purring again. The male got up and followed her into the small valley behind the rocks. 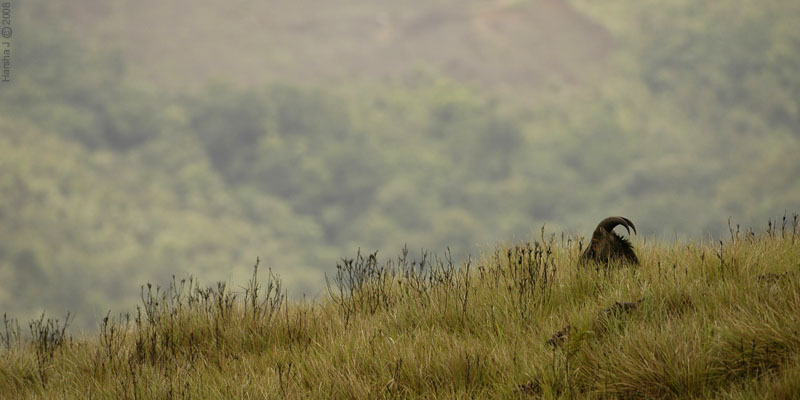 As they moved we heard chital alarm calls from the valley. They may mate for few more days, after that both will go separate ways though she will be in his territory, for he gives protection for the cubs. So if i am luckier than this i may see the cubs too in few months time! This was Seth's, mine and most of the others' best leopard sighting ever.